The 7 1/2 Foot Prelit Crimson Tree features 700 red LED lights that create a scarlet luminescence, casting a brilliant red glow onto its 1,362 PVC tips. We just got this in over at ShopPeep, and it’s just so damned delicious gorgeous, I had to share. 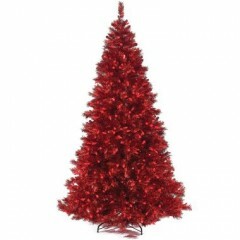 Featuring 700 red LED lights that create a scarlet luminescence, casting a brilliant red glow onto its 1,362 PVC tips, the 7 1/2 Foot Prelit Crimson Tree includes a hidden red-colored power cord, a foot pedal on/off switch and long-life lights that are rated for 25,000 hours of operation. Including a stand so you can easily move it about where you please (indoors or out), the 7 1/2 Foot Prelit Crimson Tree is available from Hammacher Schlemmer for $599.95. Someone pass the cranberry sauce. And the black forest cake. What? I’ve been a berry good boy. Hammacher Schlemmer are offering Mark's Technology News readers free shipping* on all orders over $99 until June 30th, 2017. To take advantage of this offer, simply enter voucher code HSFREE at the checkout. *Offer valid on standard shipping to US domestic addresses. Can also be used in conjunction with expedited delivery. Special shipping charges may apply for oversized items. Hammacher Schlemmer is America's longest running catalog, offering the Best, the Only, and the Unexpected since 1848. The company provides unique products that solve problems or represent the only one of their kind, and backs its products by a rather famous Lifetime Guarantee of Complete Satisfaction. Or, grab your updates via email. Hello, I check your new stuff daily. Your humoristic style is witty, keep up the good work! I think that Roomba is the best brand of robotic vacuum. I love this brand,really good products. Finally a person who writes in words I can comprehend. Reports on the latest and greatest achievements in the world of technology. Featuring everything from gadgets and electronics to communications and internet developments, scientific and environmental breakthroughs to advancements in design, lifestyle, transportation and renewable energies.